Sacrificial lambs...er, I mean seedlings. You can't tell from the pic, but many of these were planted with totally exposed roots after their coir-based root balls fell apart in the transplanting process. Does anyone remember that 2001 movie Training Day with Ethan Hawke and Denzel Washington where Hawke is a rookie cop on his first day on patrol who doesn't have a clue what he's doing? 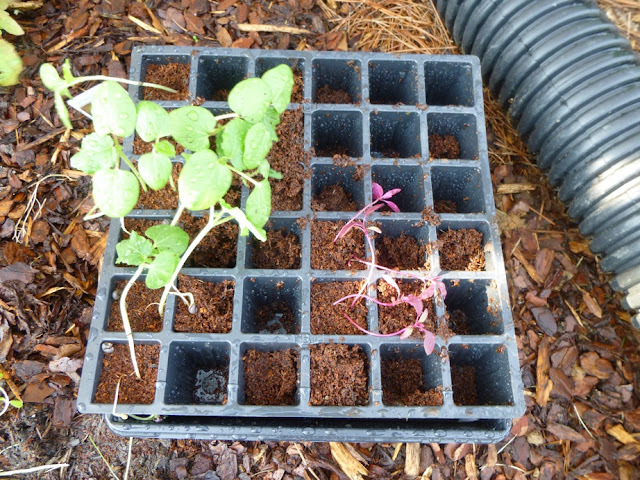 Yeah, so my Transplanting Day - moving seedlings from my Burpee tray to the Big Wide Outdoor World - was kind of like that in terms of my haplessness (but thankfully with fewer bullets and car chases). I've been trying to harden off the seedlings by giving them some time outdoors in somewhat shady and/or protected spots. But yesterday, after temps soared to near 90 degrees with a strong dry South wind, they looked pretty weak. Yeah, not good. Early this morning, I transplated some tiarellas from the North (really NW) side of the house, which was not as shady as I'd hoped and caused severe wilting in one tiarella that got full sun from about 2 p.m. onward. Into that available space, I tried to pop the seedlings. Supposedly, you're just supposed to use a pencil or something (I used the handle of a small broken paintbrush) to push up from below the tray. 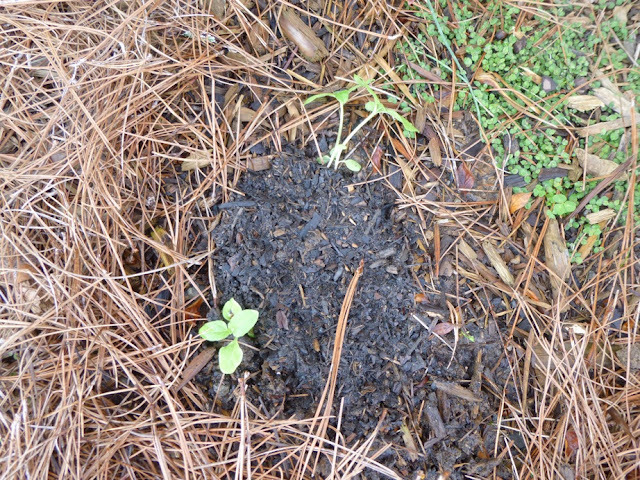 The seedling pops out with root ball intact and you slip it into the ground. Only it didn't work out that way. The coir growing medium in the seedling tray for the most part crumbled away when I tried to pop the seedlings out of the tray. In many cases, the seedling roots were left totally exposed. I'm thinking that survival rates will be very low. As you can see, some of the coir still remains in the tray despite my best efforts to pop the seedlings out intact. The okra and a few of the amaranth seedlings have stayed in the tray to be murdered/transplanted another day. In some cases, the seedlings did pop out a bit more intact, especially with the Cucumber-Leaf Sunflowers that had grown more extensive roots to tie the coir together. So hopefully those will have a better chance of survival. 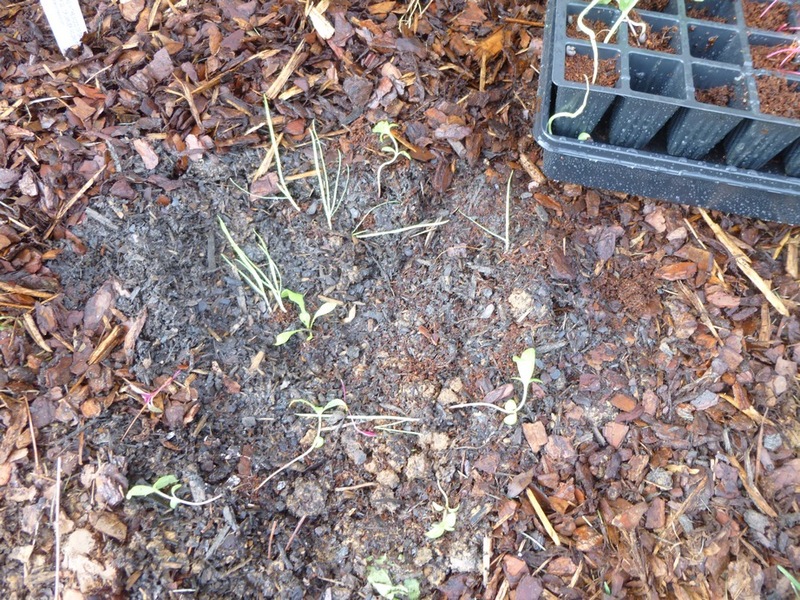 I decided not to transplant the okra or some of the amaranth today because I want to put them in a garden bed that is much more exposed to the wind and didn't want them to get shredded on their first day out. We're supposed to have strong storms roll through tonight, after which I'll hopefully transplant okra and amaranth tomorrow. I doubt the amaranth will make it, but hopefully the okra has strong roots like the sunflowers to hold the coir together. And then either tomorrow or this weekend, I'll try direct sowing my remaining seeds. 3) I think I prefer sowing seed and propagating plants directly in the garden. Independent of the crumbling coir problem, there's still the issue of the seedlings getting lanky (because I was just using natural sunlight instead of a grow light) and that they seem a lot less 'tough' than the seeds started right in the dirt. The Cucumber-Leaf Sunflowers had more extensive root systems than the other seedlings and thus were able to hang onto the coir better and be transplanted with root ball intact. I hope their chances of survival will be correspondingly better. So....any seed starting wizards out there want to tell me where I went wrong?? Should I have used a better/different seed-starting mix? Do you have to use a grow-light to get non-lanky seedlings?